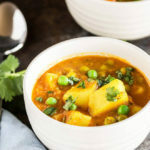 Spicy potato curry made with potatoes and nothing much really! 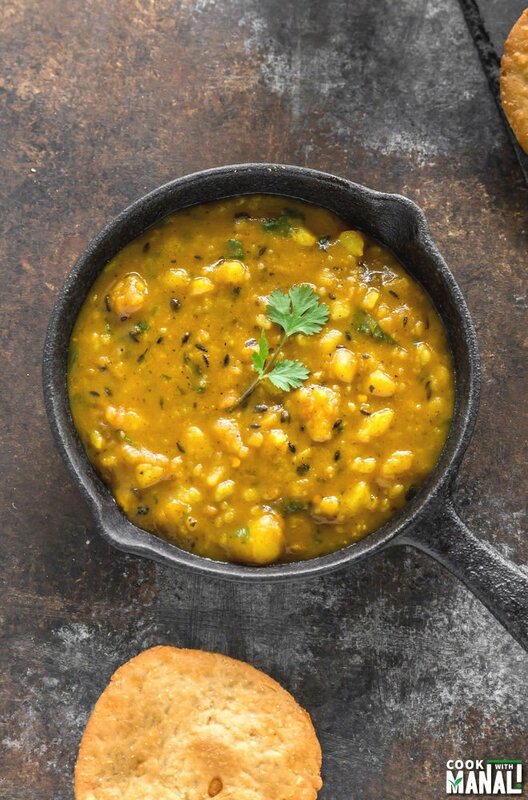 Dubki Wale Aloo are best served with khasta kachori or with Indian breads like paratha and poori! This weekend was pretty interesting. If you follow me on twitter and Instagram then you might be aware that I attended my first ever food blogger conference this weekend in Salt Lake City! It was quite an experience to say the least. There were hundreds of bloggers from all around the country, lots of great speakers and tons of food. It was great to meet people who share the same passion as you. Also, it was so great to finally put a face to some of my bloggers friends. I have followed a lot of them for quite long and it was great to see them all in person. I think it was a great escape for me personally from all that has been going on in my life. For 3 days, I was into this blogging world where it was all about food and how to grow your audience and build your brand. Well back to reality now! Before I left for the conference I made one of my favorite Indian snack, kachori and aloo. 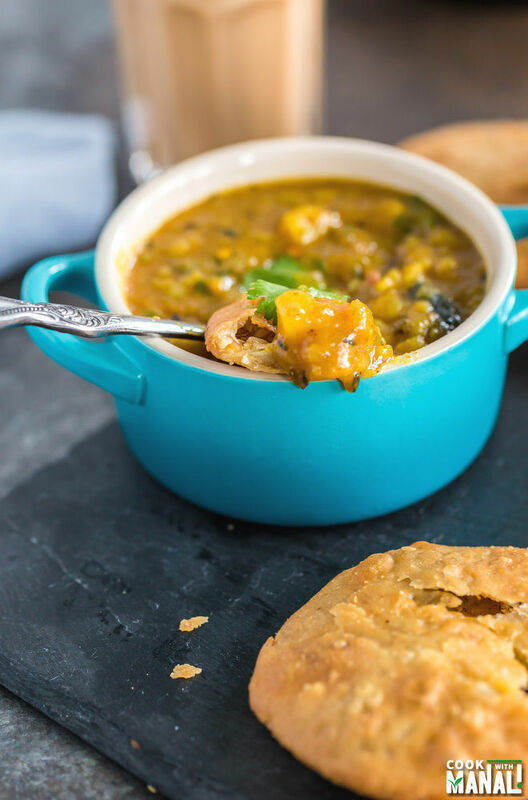 I shared kachori recipe with you guys on Saturday and today I am sharing the recipe for the aloo (spicy potato curry), that is served with kachori. 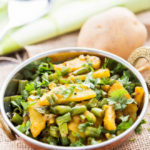 This particular style of potato curry is called Dubki Wale Aloo in northern parts of India especially in Mathura/Agra. Dubki means “to swim”, so it’s like potatoes are swimming in the curry! This recipe is fairly simple but very flavorful. To get the authentic taste of dubki wale aloo, I highly recommend using mustard oil to cook this. In my house in India, we use mustard oil in 90% of our recipes. Mustard oil has a very strong smell so a lot of people don’t cook with it but trust me, it works so well in most north Indian recipes. The thing with mustard oil is that you need to heat it really well before adding in the seasoning. If the oil isn’t heated enough, it will taste bitter. So heat the oil till it gets really hot, to the point you see some fumes coming out of it. Then add the seasoning and everything else. I add little cornstarch to my recipe. It thickens the curry a bit and that’s the exact texture I wanted. I always used to get these kachori-aloo at the railway stations and that aloo was always little thick and crushed. You also need to let the curry simmer for a bit so that all flavors can come together nicely. 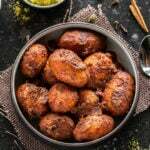 Dubki wale aloo also taste fantastic with rice or paratha or simple roti. It’s one of those things which you can make in a very short time and with minimal ingredients. This recipe is vegan because I have used oil to cook it. You may use ghee to make it more delicious! 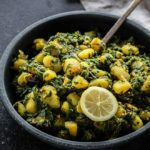 Hope you guys like my recipe for dubki wale aloo. I was pretty excited by the way it turned out, it tasted exactly like what I used to buy at railway platforms 🙂 . Add the boiled and crushed potatoes. Also add turmeric powder, amchur, garam masala powder and kashmiri red chili powder. Mix and cook for 30 seconds. Add water, salt and give a good stir. Lower the heat to medium. Let the curry simmer. Take a potato masher, and mash the potatoes a little. You don’t need to completely mash them but they should be quite crushed. As the curry is simmering, dissolve 1 teaspoon of cornstarch in 1-2 tablespoons water and add to the curry. The curry will thicken a bit. The curry should simmer for around 15-20 minutes in total or till all flavors come together. Add chopped cilantro and remove pan from heat. 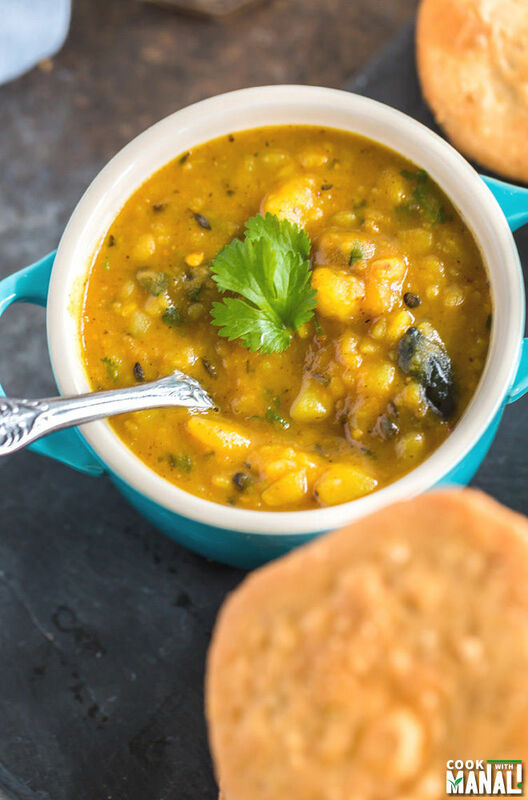 Serve dubki wale aloo with khasta kachori or with any paratha of your choice! * Adjust the amount of water in the recipe if you want a thinner curry. Remember that the curry continues to thicken as it cooks so adjust accordingly. * The potato I used was huge, in India you would probably need 4 regular potatoes for this! Heat 1 tablespoon of mustard oil to a pan. Heat the oil really well else you will get a bitter taste. Once the oil is really hot, add cumin seeds and methi seeds. The seeds will sizzle right away. Add the boiled and crushed potatoes. Also add turmeric powder, amchur, garam masala powder and kashmiri red chili powder. Mix and cook for 30 seconds. Let the curry simmer. Take a potato masher, and mash the potatoes a little. You don't need to completely mash them but they should be quite crushed. We make a curry very similar to this and it always goes down well. Especially as it’s really cheap to make as well. Oh this curry looks delicious, Manali! I love the potatoes in here. This dish looks like the perfect comfort food. And it was SO nice to meet you this weekend! The curry looks very delicious and comforting! So glad you had fun at the conference Manali! This dish looks comforting and delicious! Pinning! This curry sounds wonderful! I bet it truly is a soothing comfort food. I just adore your new layout!! It was so nice to meet you and enjoy Salt Lake City together! I’m so happy I got to meet you Manali — it was one of the highlights of my weekend! This curry looks so comforting and delicious, too, and your site redesign is so pretty! Girl this looks delicious!! Reminds me of when I am in India and now I am missing home badly!! Wish you lived closer! This dubki wali aloo looks so intriguing , Manali. Feeling hungry! SO jealous you got to go to Salt Lake City FB conference! I hope you had a ton of fun.. but I’m 99.9999% sure you had a blast! I’ve never had dubki wale aloo before, but I LOVE potatoes! This looks absolutely delicious, Manali! Love the new lay out BTW! Cheers, friend! Glad you had an awesome time at the conference, Manali! Wish I could have gone because it would have been amazing to meet you! And this gorgeous dish is calling my name! It definitely looks like a dinner that’s right up my alley! That blogging conference sounded fun! I’ve been wanting to go to one for a while, but I seem to hear about them after the fact 🙂 This potato curry sounds amazing! 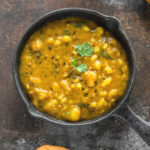 My family LOVES Indian foods and flavors and I know they would just love this dish! Will have to try it soon!